Badminton is played on a special court using a racquet and a shuttlecock or birdie. Badminton is a fast paced sport combining speed and agility with a number of technical strokes. Great for fitness and fun and one of the activities for kids that can be enjoyed in the backyard during school holidays and weekends! Kids playing badminton in the backyard. Are your kids bored with tennis? If kids are playing in the backyard it is a good idea to make sure there is enough space and any tripping hazards are removed from the area. Badminton can be enjoyed by kids of any age who are able to grip and swing a racquet, but formal badminton tuition generally begins at around 4 or 5 years of age. It’s an activity that the entire family can play, so it presents a great opportunity for parents to spend highly enjoyable quality time with children. How can you organise Badminton lessons and matches for your kids? Other important things to learn include footwork, correct grip and the rules of the game. 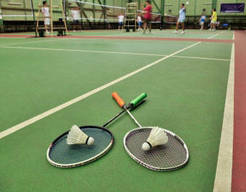 Fun badminton activities for kids include ‘wild birdies,’ ‘blanket badminton’ and net play. Badminton has been played by families in backyards around the world for decades. Playing badminton can be fast and fun so why not let your kids give it a try?